The antitragus is situated opposite and behind the tragus. It is an arch-shaped cartilage structure. The groove in the middle of the two traguses is known as incisura intertragica. It is also known as the intertragic notch. The Hormonal zone is found in this area. Incisura intertragica is a major anatomical landmark. The antihelix arises at the antitragus and goes anterior as well as parallel towards the helix, basically as a single protuberance. The Antitragicus continues towards the inferior margin of the anti-helix, from the outer surface of the upper margin of the antitragus. It will estimate these two portions of cartilage, and move the antitragus a little outwards and backwards, helping in opening the meatus. The apex is the most unique part of the antitragus and is an important landmark. Reflex points are located in the antitragus for portions of the cranium and brain. One end of the antitragus starts at the incisura intertragica that splits the tragus and the antitragus. 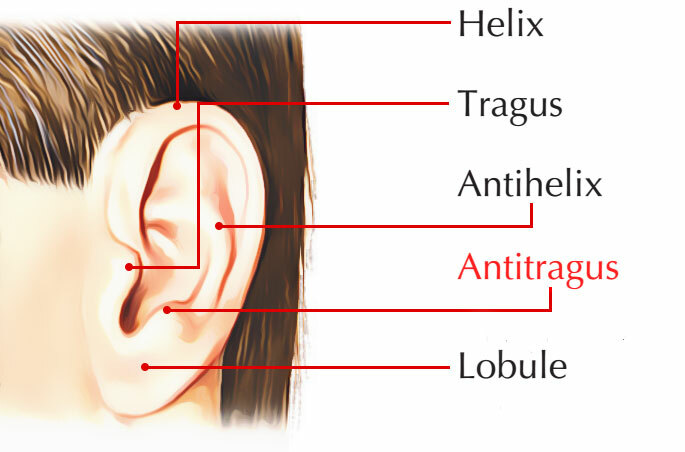 The antihelix is attached with the other end of the antitragus. At this junction there is a notch which can be felt. The notch is a landmark which resembles the point where the base of the skull articulates the first cervical vertebra.